In celebration of Earth Day yesterday, I decided to look up some fun recipes to recreate here on Small Kitchen College. I was trying to find something all-natural, using lots of vegetables and environmentally friendly ideas. I came upon this Meatless Mondays recipe from a food blog My New Roots. I was so astonished by her genius idea of using a cabbage leaf as a bowl that I decided that I must try it out for myself. The recipe calls for the use of Freekeh, a grain similar to a cracked wheat. But the funny name and the exotic origin (Lebanon, Jordan, Syria, and Egypt) was a bit too scary for me, so I opted to try something that seems more approachable: quinoa. As a quinoa virgin, I had to seek out a little bit of help from my roommate and food buddy, Zoe. She graciously accompanied me on my quinoa production and answered all of my never-ending quinoa questions (like, what are those weird white tails on the grains?). To my surprise, quinoa cooks very similarly to rice, so I think next time I will put it in my rice cooker and let the machine do the cooking! 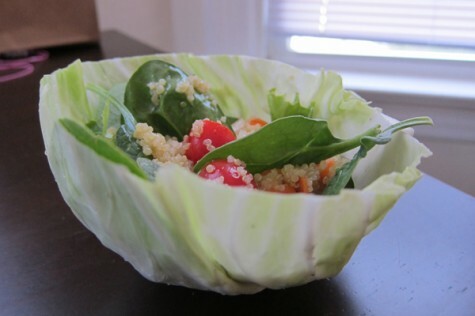 The end result was a light and fresh salad, served on a beautiful cabbage bowl, a perfect dish for a spring picnic! Julie Sophonpanich is a senior at Brown University concentrating in History of Art and Architecture. She enjoys cooking and baking with her friends, strolling through grocery stores, and traveling to sample delicious cuisine. Measure out 1/2 cup of quinoa and rinse well using a strainer. Place quinoa in a small pot and add 1 cup of water. Bring water to a boil on medium-high heat (1-2 minutes). Cover the pot with a lid and lower the head down to medium. Let quinoa cook until all of the water has been absorbed (10-15 minutes). Transfer the quinoa into a large mixing bowl and place in the fridge to cool. Prepare the dressing while waiting for the quinoa to cool down. First mince the garlic. In a small bowl, combine minced garlic, olive oil, lemon juice, honey or agave, and a pinch of salt. Whisk the ingredients together well. Taste the dressing and add more salt if necessary. Set aside. Wash all the vegetables for the salad. Half the cherry tomatoes; chop the onions; and thinly slice the carrots. By this time, the quinoa should be cooled and ready. Take the mixing bowl out of the fridge. Drizzle the dressing into the bowl and combine well. Then, add tomatoes, onions, and carrots and stir. Last, add spinach into the bowl and fold it in lightly. Place the mixing bowl back into the fridge until it is ready to be served. Rinse the head of lettuce. Peel off the top two layers of lettuce leaves as they tend to have black tips and not as crunchy. Peel out four leaves as bowl and place them on your dining table*. 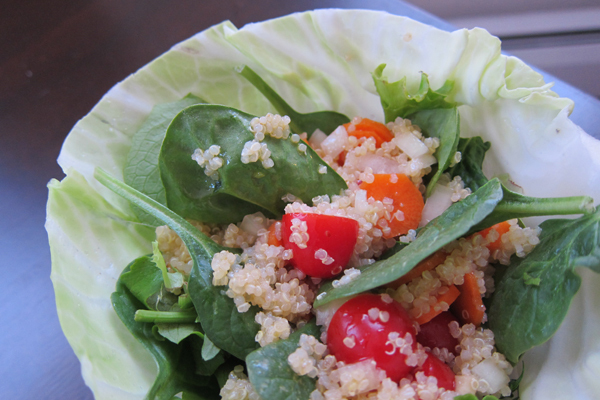 Take the quinoa salad out of the fridge and distribute it into the four lettuce leaf bowls. *NOTE: Don’t forget to wipe down your dining table as you will be placing your bowls directly on the surface. Categories: Blog, Dietarily Restricted, Eating, Green Living, Nutrition and Health, and Recipes. Cooking Method: On the Stove. I'm Cooking For...: Earth Day, Meatless Mondays, and Myself. Type of Food: Salad, Vegan, Vegetarian, and Vegetarian Main. I Don't Eat: Any Animal Products, Dairy, Gluten, and Meat. ooh – what a beautiful salad — it would be wonderful to have that now in Bangkok — it is sooo hot and a refreshing salad would be just perfect! I love the presentation! Would be so fun and surprising at a dinner party. It’s a little like Korean ssam. It’s a piece of art there. Delicious looking! Quinoa is my favorite grain, I was informed it cooked like rice but had a nutty flavor. Bought it cooked it and was hooked. I will try this out because after many years I have run dry on way to cook it. SOo many thanks! Thanks for sharing this idea interesting blog, Please continue this great work.